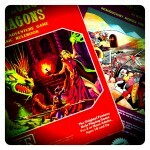 I thought I’d kill a little time today by taking some heavily-filtered shots of my classic B/X gaming stuff. 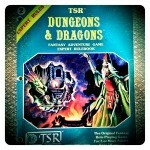 The boxes for my old Basic & Expert Dungeons & Dragons sets are long gone, as are the dice (alas! 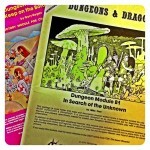 ), but the rulebooks and the modules that came with ’em are still in pretty good shape. 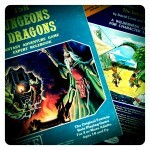 The books still live in the blue Trapper Keeper I bought for them back in ’82 or so. The modules live in a plastic storage box with my other assorted modules. 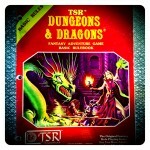 Last note: I think that B/X is hands-down the most photogenic of the Dungeons & Dragons line. 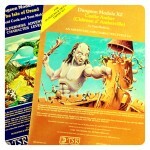 The bright colors, the engaging-yet-cartoony art (especially the Otus covers), the paper covers of the books and modules. These things just beg to be snapped casually. This entry was posted in D&D on April 16, 2013 by the venomous pao. I agree with you about the photogenic quality of the Basic stuff. The artwork really fired my imagination, back in the day. And that’s not just nostalgia talking . . . I think. I laminated the cover of B2, which is probably why my copy is still intact. B1 didn’t fare as well. I’m (obviously) with you on this, G-Man. It can be hard to pin down nostalgia and know when it’s affecting you, but I really do think that the B/X era nailed it. 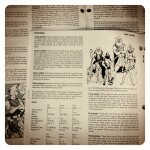 I have a theory (heavily informed by some of Scott McCloud’s work in Understanding Comics) that the abstracted, cartoony nature of the artwork by Otus, Willingham, and Dee (and the rest) in the B/X rukebooks (and elsewhere) really allows you to project yourself into the action and feel immersed in the D&D worlds in a way that the (hyper)realism of the later era artists (Easley & Elmore, especially) doesn’t. For me, at least. I agree, the weird fantasy vibe of the era is what really grabbed me more than anything else and still gets my attention today. I loved all the work done by the luminaries of the day from Americans, like Otus and Dee to the Britpunk stylings of Ian Miller, John Blanche, Russ Nicholson and Wil Rees. I was tempted to buy Hackmaster and DCC based on that alone, because half of a game for me is the inspirational level of the art. It isn’t nostalgia glasses, its an appreciation for a style of art that stirs the imagination like no other and is intrinsically linked to the experiential bases of millions of us who grew up in that time and saw the birth of a hobby. BotA is partly designed on that assumption. And I still have my B/X dice. Nyaa nyaa nya nyaa nyaaaaa! Well said, Nathaniel. And I willingly confess that it was the art that got me to give DCC a bunch of my attention initially. Hackmaster seemed too jokey to overcome despite its attempt to spear me with the Otus covers, though, so I never looked at it. I am very fond of the art choices you made for BotA, by the way. They definitely hit the same notes for me.